We’ve been asked this regularly recently when talking about offering new and previously refused foods to kids. It’s tough and it can be disheartening at times to see your planning, time and hard work in the kitchen get tossed aside at the dinner table. But, it’s also very rewarding when you see your kids show a positive attitude towards food they normally disregard. So in my mind it’s worth it. See, if we only offer foods to our kids that they DO like then they never get a chance to become more familiar and more accepting foods they are still learning to like. And more often than not the list of foods they do enjoy will become smaller and smaller. 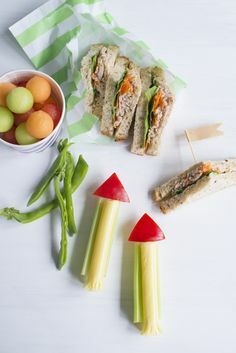 Alternatively, regularly offering your kids a variety of nutritious foods (in a POSITIVE and PRESSURE-FREE environment) will help expand the variety of foods they enjoy. All in good time though, as it doesn’t happen overnight. SO here are 6 ways I try to reduce food wastage when offering a variety of nutritious foods, while trying to maintain a positive attitude towards all foods and to mealtimes. 1. 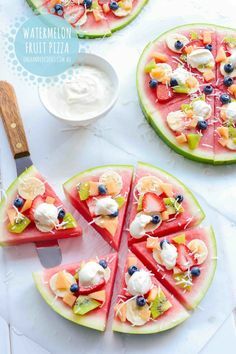 OFFER SMALL PORTIONS: At mealtimes I try to only offer a small portion of the food on a tasting plate my kids normally refuse alongside larger portions of the food they do eat and enjoy. They’re happy and it helps reduce the anxiety (and sometimes panic) of seeing something on the table or plate they don’t like. These are bobo&boo bamboo sectioned plates, use the code: ONEHANDEDCOOKS for 10% of their entire range. Ice cube trays make a nice change to dinnertimes and are fabulous for fussy eaters – find silicon ones like these at Kmart or here. 2. 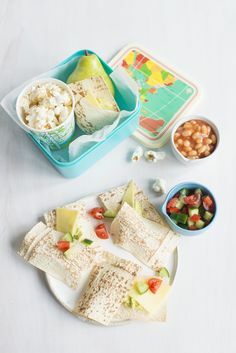 FAMILY MEALS: This way we can enjoy the meal too and have leftovers for lunch or in the freezer for another meal if the kids aren’t that keen. The opportunity to role model positive eating behaviours is greater too with family meals so if they see you eating it they might more inclined to give it a go one day too. 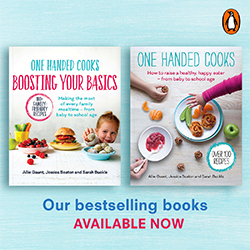 For more family meals: Family Foodie ebook, our cookbooks. Skewers encourage engagement and interest in new foods. 4. MEAL PLAN: Meal planning (I have times where I am great at this and other times I am useless and go day-by-day) helps me to buy only the food we need and also balance out the weekly meals so there is a mix of meals they love, meals they like and meals they are still learning to like. 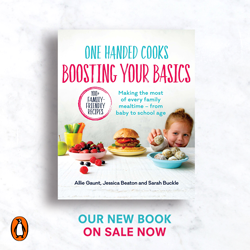 Our first best-selling cookbook, One Handed Cooks – How to raise a healthy eater, offers nutritious mealtime inspiration for the whole family. 5. KEEP A WORM CAFE OR COMPOST BIN: Worm cafes are small, easy to maintain and take a small amount of our fruit and veggie scraps. They breakdown into compost helping to feed my garden and reduce wastage. Many local community gardens also run a SWAP and GO compost program where you can take small buckets home (or use your own), collect your food scraps and then take them back to the garden for their compost bins. We’ve had a worm cafe (fun for the kids!) for a while but I recently introduced a compost bin too into our garden too for the majority of my scraps and it has helped reduce my general waste significantly in the two months I have been doing it. 6. CHICKENS: If it works for your family and your space, having a few chickens can help out with food wastage plus supply you with the best-tasting, freshest eggs you’ve ever tried. Chickens love some of our food scraps too. My 3 chickies love leftover cereal, corn, pasta, half-nibbled apples, pasta, meat, scrambled eggs etc. I hope this has helped you become more accepting of some of the food wastage feeding little kids creates, particularly at a time when we are trying to put the #waronwaste, while trying to contain it at the same time too. Here’s to reducing waste and keeping mealtimes happy! Note this post contains affiliate links. If you purchase a product through an affiliate link, your cost will be the same but we will automatically receive a small commission. Your support is greatly appreciated and helps keep our content free and widely accessible to all. We will only ever promote products we genuinely believe in.